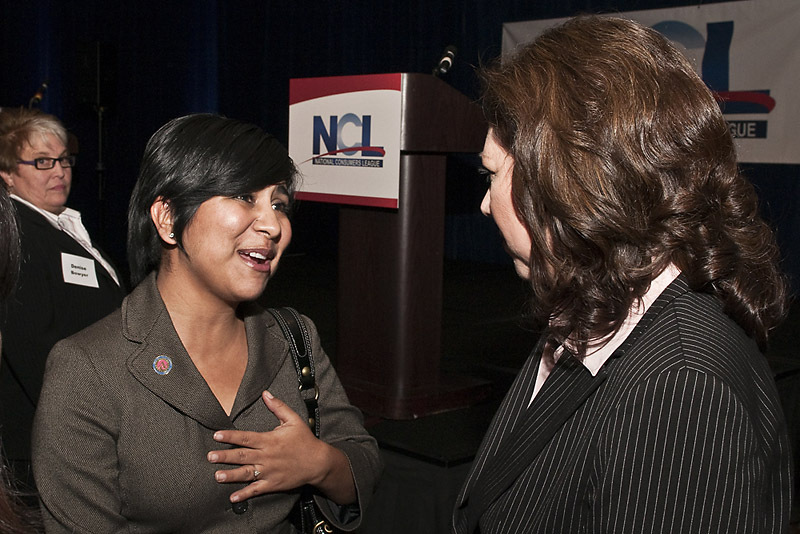 By Reid Maki, Child Labor Coalition Coordinator [caption id="attachment_801" align="alignright" width="300" caption="Norma Flores (left) speaks with Labor Secretary Hilda Solis at the 2009 Trumpeter Awards Dinner."] [/caption] At the National Consumers League's (NCL) annual Trumpeter awards dinner earlier this month, I watched a young women with a surprising background mesmerize nearly 500 people with her story. We heard terrific speeches by award recipients U.S. Secretary of Labor Hilda L. Solis, CBS News’ Steve Kroft, and California Business Reporter Lynn Jimenez, but the most surprising speech to me was from Norma Flores Lopez, who spoke about her childhood harvesting fruits and vegetables in American fields. Norma, who is now in her mid-20s, was one of the hundreds of thousands of farmworker children who toil daily in American fields to feed us consumers. She began working with her four sisters in the fields when she was only 12 because of loopholes in United States child labor law that allow children working in agriculture to work at younger ages than children in other industries. “I can still remember waking up at four in the morning, sitting at the edge of my bed, lacing up my muddy boots, grabbing my hoe and walking towards the old school bus waiting for us in the [migrant] camp parking lot,” said Norma. Because of the heavy morning dews, she often started work in a raincoat. A few hours later, the blazing sun made her sweat like crazy. “I hated it,” said Norma. “I hated to work in the fields. I hated getting sweaty and dirty. I hated getting blisters and cuts and sunburns. I hated finishing my row of work only to see there was no water to drink at the end. I hated to have to walk half a mile to go to a dirty portable toilet. I hated how the work affected me outside of the fields. I hated having to enroll in school late every year, to have to make up months of assignments and have to fight to get my school credits. More than anything, I hated knowing my parents needed me out there to make ends meet, because it meant I couldn’t say no. Even though I was only a kid, I knew I didn’t belong there. I knew I could do more than hoe weeds for 70 hours a week.” “Child labor in agriculture wears you down emotionally and physically, and is one of the most dangerous occupations,” added Norma, who now works on the Children in the Fields Campaign for the Association of Farmworker Opportunity Programs based in Washington, DC. NCL and the Child Labor Coalition, which NCL co-chairs, are partners on the campaign, which seeks to remove the loopholes that allow children like Norma and her sisters to work at very young ages in the fields. An estimated 400,000 children help harvest our food. Norma is aware she is one of the lucky survivors of the years of hard work. She worked hard to get into a prestigious high school in Texas, did well, and went on to graduate from college. Many farmworker kids are not so lucky. Advocates believe the school dropout rate for migrant children is between 50 and 80 percent. Norma worries about the kids left to work with their families, and she urged her attentive audience to help pass the Children’s Act for Responsible Employment, a bill introduced by Representative Lucille Royball-Allard of California this September. The CARE Act will address the inequities and harsh conditions faced by children currently employed in agriculture in the United States by amending the Fair Labor Standards Act of 1938 to remove the exemptions that allow children in agriculture to work at younger ages than other industries — unless they are working on their family’s farm, noted Norma. It will also increase the penalties for violators of the child labor laws and require greater data collection from the Department of Labor. With Secretary of Labor Solis listening on, Norma thanked the cabinet member for her co-sponsorship of an earlier version of CARE when she was in Congress, as well as her work on behalf of farmworkers. “Although I am married now and working in DC, thousands of miles away from the fields I grew up working in, I am still very connected to the migrant farmworker community, said Norma. “My parents are currently working in Iowa’s corn fields, and my two younger sisters continue to help them by working by their sides. I continue to see the problems that have plagued the farmworker communities—from the housing conditions, to the working conditions, to the plight of child labor in agriculture.” “Changes need to be made now to ensure all children have a healthy childhood and access to quality education,” Norma urged. Anyone interested in being placed on a listserve to get updates about the Children in the Fields Campaign and the progress of the CARE Act should email NCL at reidm@nclnet.org.